Today was my 25th birthday, and what better way to celebrate than to take a trip to the Met with a friend? It turned out to be a rather unique experience — I handed over my camera and let Jered have free rein, leading me along snapping shots of whatever interested him. We both work in a restaurant, so our pace was much faster than the typical museum goer; we power walked the length of the museum and back, starting on the roof. 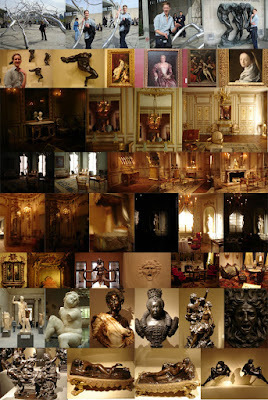 We wandered through 19-Century European Painting and Sculpture (love the tremendous collection of Rodin!). Then on to European Painting, Decorative Arts, a little Medieval, Egypt, American Arts, including the recently re-opened Frank Lloyd Wright room, Greek and Roman Sculpture, and finally Cast in Bronze, the French Sculpture exhibition. It was fun to cover so much ground in such a short time. 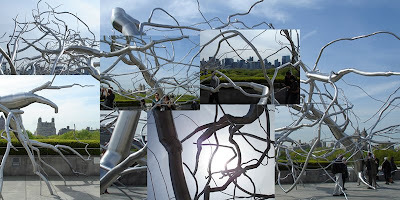 The Iris B. Cantor Roof Garden finally opened for the season today with Roxy Paine's massive steel sculpture, Maelstrom. While the Metropolitan Museum of Art is hands-down my favorite place in New York City, the rooftop is truly its crown jewel — and Paine's sculpture serves to unite the architectural with the organic as it twists and mangles over the trees in the park with the midtown Manhattan skyline in the distance. I like the way the branches of the sculpture frame the negative space between them: a building in one slice, a person in another — it breaks up the background into interesting vignettes. It also reminded me of the drawings I'd make when I was a kid, freely scrawling loops and lines and then going back and filling the spaces between with different colors. After more than a year, the Metropolitan Museum of Art's exterior is finally clear of the fences that blocked the north end of the stairs. Unblemished, its magnanimity is restored (magnanimity : the quality of being magnanimous : loftiness of spirit enabling one to bear trouble calmly, to disdain meanness and pettiness, and to display a noble generosity — this word popped into my head, and it turns out, it truly reflects my feelings about the Met). 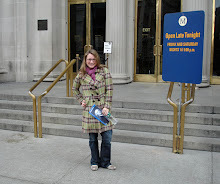 Perhaps the characters of Gossip Girl will return to the Met to have their lunch on its steps? A beautiful sunny day in Petrie Court. 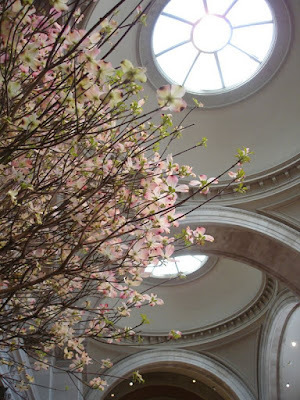 I haven't done this before, but as I have become more ingrained in the world of blogging, I've come across some really great stuff pertaining to the Metropolitan Museum of Art. It's funny how on the internet, one tangent leads to another and another, the amount of information being produced and the rate at which it's happening is staggering. I'll try to post a link when I find something of interest as I continue my quest to know everything. 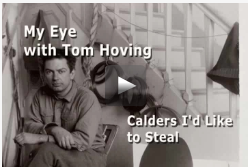 Just tonight I discovered this video archive of My Eye with Thomas Hoving (former Met director), thanks to a tweet from artnet.com. Hoving reviews exhibitions with fervor and expertise — they are a real delight to watch, especially the one's I've been to in person, like Art and Love in Renaissance Italy, for example. Hoving wrote Making the Mummies Dance about his tenure as director of the Met from 1967 to 1977. I just discovered ART.CULT, the arts and culture offshoot of wnyc.org. Then I came across this podcast about the postcard collection of Walker Evans. Walker Evans: The Picture Postcard is on view at the Met until May 25, 2009. For some reason I began thinking about The Veiled Christ, by Kehinde Wiley — perhaps because The Oxbow: After Church, after Cole, Flooded, Green Light, by Stephen Hannock (who left a comment this week! ), has returned to its spot next to another Hannock landscape, leaving me wonder what has happened to Wiley's exquisite piece. Naturally, I googled Wiley, and though I didn't find the answer, I did come across these two great blogs that do a wonderful job reviewing his work: Luis Colan and Popular. 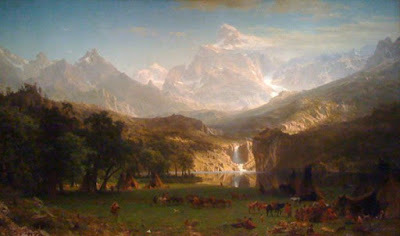 For Earth Day, I thought I'd share with you my favorite landscape currently hanging with its fellow American Landscapes in the Lehman Wing: Albert Bierstadt (1830-1902), The Rocky Mountains, Lander's Peak, 1863. This is particularly arresting for me because it is a snapshot of a point in time, a landscape since extinct by the settlement of the west and the proliferation of the American Indian. When I look at this landscape, I think about the Rockies of 1863 and the frontier that exists only in history books and on Bierstdt's canvas. 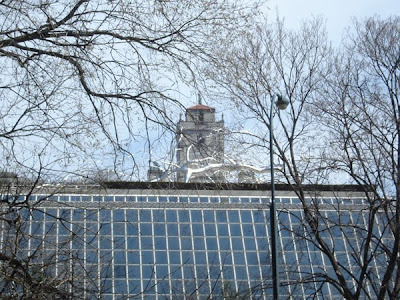 I was walking through the park the other day on my way to the Met, when I noticed a glowing metal structure protruding from the museum's roof. 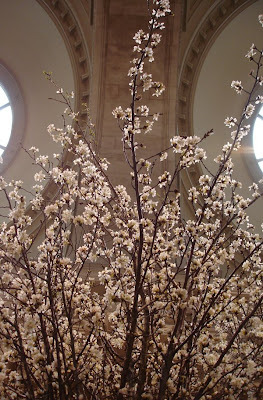 I recognized it immediately as the upcoming installation, Maelstrom, by American artist Roxy Paine. From what I can tell, the sculpture will be captivating — its theme is surely thought-provoking. Set against, and in dialogue with, the greensward of Central Park and its architectural backdrop, this swirling entanglement of stainless- steel pipe showcases the work of an artist keenly interested in the interplay between the natural world and the built environment, as well as the human desire for order amid nature's inherently chaotic processes. (metmuseum.org) The museum itself is a man-made juxtaposition to nature, or at least that of Central Park, so the relevance of this piece is not lost on me — I am holding my breath to see it up close! 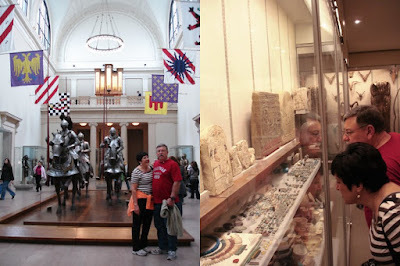 My dad and his girlfriend, Georg-Ann, came to visit me in New York this week; and, of course, they requested a private tour of the Metropolitan Museum of Art á la mí. Like the last tour for my friends, I wanted to cover as much ground as possible before their feet started throbbing and their eyes glazed over. 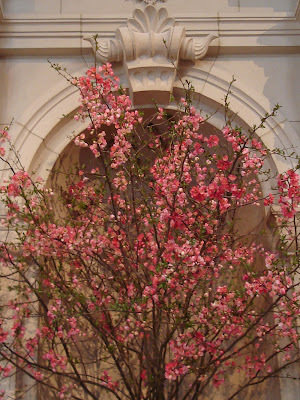 We began with European Decorative Arts — I like to show people the period rooms to break them of the notion that art museums are stodgy, paintings-on-the-wall places. Next, we hit up Arms and Armor, bringing back memories of my dad's somewhat extreme passion for Medieval Times (the dinner and tournament) — we seriously went like 5 times when my brother and I were younger. No visit would be complete without a trip to Egypt, so we ventured from 3,000 BC through the Tombs of Meketre and Hatshepsut until we reached the Temple of Dendur. Then we took a quick peek at the American Wing, particularly The Palace and Gardens at Versailles, The Roccoco Revival Room, Vanderbilt's Herder Brothers Library Table, and the Frank Lloyd Wright Room. Though we had worked our way to the far corner of the museum, no visit is complete without throwing a little Modern Art into the mix. So I led them back through the Great Hall, quickly through Greek and Roman Sculpture and Oceanic Art to the Picassos, Balthuses, Legers, Giacomettis and Rosenquists in the gallery where we ended our tour. 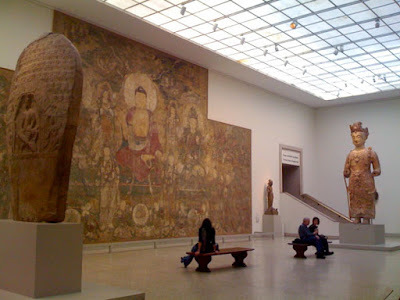 The most rewarding thing for me (though I've yet to meet someone as enamored with the Met as I), is to see the look of awe on people's faces when they view the museum's collection. I watched Georg-Ann's jaw drop a dozen times and my dad grin with satisfaction. It was a wonderful visit. It was an extraordinary day in New York City - especially considering the snow flurries we got yesterday! After my walk through the park on my way to the Met, I could barely bring myself to go indoors (it'll be wonderful when the rooftop garden opens in May). Nonetheless, I entered my sanctuary yet again, with no agenda as usual, when I remembered the perfect spot to go. I am overwhelmed by the amount of information out there. The timeline and variety of human civilization is baffling to me... As is the scope of the universe and its history, and the laws that govern the physical world, and the instances in which those laws are broken or proven null. 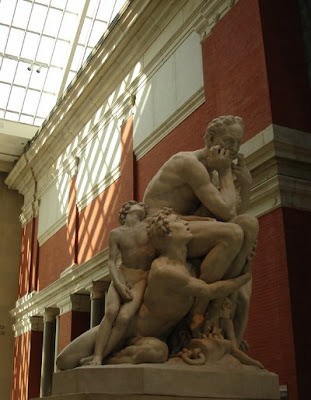 As I sit in the Met listening to a French tour, thinking of all the different languages that ever existed, and the customs, artwork, belief systems and rituals, I've decided that we as the product of this history should have a profound reverence and appreciation for it — as well as general bewilderment.